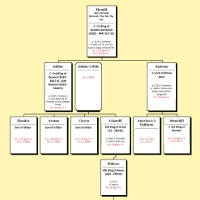 Family Tree of the Kings of Arnor and Arthedain. A Númenórean King was monarch, with the power of unquestioned decision in debate; but he governed the realm with the frame of ancient law, of which he was administrator (and interpreter) but not the maker. In all debatable matters of importance domestic, or external, however, even Denethor [Steward of Gondor] had a Council, and at least listened to what the Lords of the Fiefs and the Captains of the Forces had to say. Aragorn re-established the Great Council of Gondor, and in that Faramir, who remained by inheritance the Steward (or representative of the King during his absence abroad, or sickness, or between his death and the accession of his heir) would [be] the chief counsellor. The last leaders of the Faithful, Elendil and his sons, escaped from the DownFall [of Númenor] with nine ships...; and they were borne on the wings of a great storm and cast up on the shores of Middle-earth. There they established in the North-west the Númenórean realms in exile, Arnor and Gondor. Elendil was the High King and dwelt in the North at Annúminas; and the rule in the South was committed to his sons, Isildur and Anárion. [After] he had given counsel to Meneldil, his brother's son, and had committed to him the realm of the south, [Isildur]... marched north..., for he purposed to take up his father's realm in Eriador, far from the shadow of the Black Land. [In] the north Arnor dwindles, is broken into petty princedoms, and finally vanishes. The remnant of the Númenóreans becomes a hidden wandering Folk, and though their true line of Kings of Isildur's heirs never fails, this is only known in the House of Elrond. Arnor. Elendil †S.A. 3441, Isildur †2, Valandil 249, Eldacar 339, Arantar 435, Tarcil 515, Tarondor 602, Valandur †652, Elendur 777, Eärendur 861. Arthedain. Amlaith of Fornost (eldest son of Eärendur) 946, Beleg 1029, Mallor 1110, Celepharn 1191, Celebrindor 1272, Malvegil 1349, Argeleb I †1356, Arveleg I 1409, Araphor 1589, Argeleb II 1670, Arvegil 1743, Arveleg II 1813, Araval 1891, Araphant 1964, Arvedui Last-king †1975. End of the North-kingdom. Chieftains. Aranarth (elder son of Arvedui) 2106..., Aragorn II F.A. 120.
c. circa: the date is approximate.